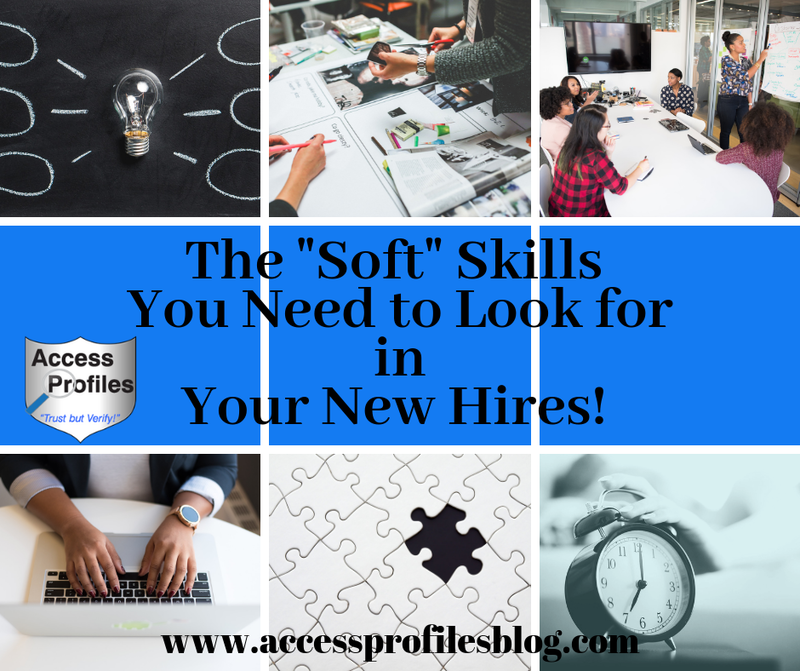 Access Profiles, Inc.: The "Soft" Skills You Need to Look for in Your New Hires! Do You know why good “Soft” Skills are so important in your employees? Do You even know what are“Soft” Skills really are? People that possess good “Soft” skills are able to work with and lead others. They are creative problem solvers and are often inherently likable ~ all of which make for valuable employees. When you are looking for a new hire, many of your applicants will have the technical “hard” skills needed to do the job. But those that also possess coveted soft skills are the ones you really need to consider! Even candidates that may not have every qualification you desire can be great new hires, if they possess those soft skill traits that are hard to teach. Good Work Ethic - Look for someone that takes their career seriously. They are hard wired to get the job done, are punctual, and meet deadlines. Checking with past employers, references, or educators is a good way to get a glimpse into this trait. Leadership - The kind of leaders you want can not only take charge but are also able to work well as a team. They can coordinate and lead a team in such a way that it makes the team as a whole better. They are confident, but not cocky. They inspire those around them and get them to work at or above their potential. They also understand the importance of delegating and trusting others to get the job done. Leaders like this will grow personally and professionally, along with those around them. Team Player - While the phrase “team player” may seem cliche, the traits it embodies are invaluable. Someone who possesses these skills knows how to cooperate with others, while still being able to take on a leadership role when needed (see Leadership). They are able to accept and offer ideas to promote productivity and give feedback to help the team as a whole succeed. Effective Communicator - Being a good communicator means not only being able to effectively share views but also being a good listener. Those that possess this skill are able to effectively get a point across in a way that results in understanding. This skill is important in dealing with both co-workers, managers, and clients. Resourceful Problem Solver - Look for applicants that can think logically in the face of adversity or problems. They are flexible and able to look at a problem and come up with a creative, unique solution. Employees who are strong in this skill can help lead to company improvements, increased efficiency, and innovation. Time Management - People good at this skill are able to prioritize and make the most of their time. Like good leaders, they delegate when necessary, and to the person who is best able to get the job done. They are efficient but don’t cut corners. Employees who manage their time well are often your most productive. Willingness to Learn - The desire to keep learning new skills and to take on increasing responsibilities is the earmark of a valuable employee. This is especially valuable if your applicant doesn’t possess every one of the technical or “hard” skills to do a particular job. Hiring someone who is open to and capable of learning new things, along with a combination of other soft skills, can ultimately be the most desirable. Likable - “Likability” might be the most underrated “soft” skill of all. It is something that really can’t be taught. It is an inherent ability to put those around them at ease and make people want to be with them. People that are likable often have a positive attitude. Being likable alone is not enough of a reason to choose someone as a new hire. However, hiring someone who is unlikeable, even though they have the skills you need, is often in the end, a mistake. But, when likability is combined with any of the other soft skills, and a few of the hard skills needed to do the job, you will gain a valuable asset to your workforce. Discover the benefits of hiring likable employees in your Small Business in “Do Nice People really Finish Last?”. Hiring with Soft Skills in mind is especially important for a Small Business. 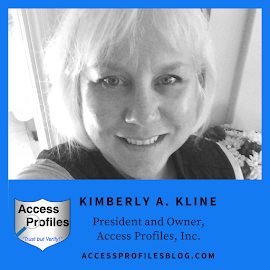 When you own a small business, everyone works in close proximity and often wears many hats. In addition, Small Businesses may not always attract applicants with every hard skill needed. Hiring for the soft skills that are hard to teach, and training for the other skills you need, is often a better alternative. Discover more about how you can attract top talent to your Small Business in "4 Reasons Why Job Seekers will Want to Work for Your Small Business"! And you can find out more about the best employees to look for in your Small Business, and the ones to avoid, here! Overall, the best employers look for a mix of the hard skills required to do the job and the soft skills that will help them and the company as a whole succeed. And when you find that perfect mix, you are on your way to making the best new hire for you and your company. 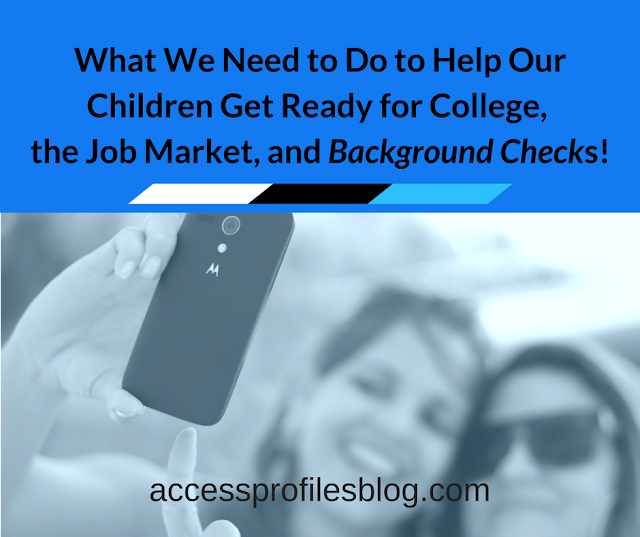 Just remember, no matter how much you may be impressed with your applicant, don’t skip the background check! 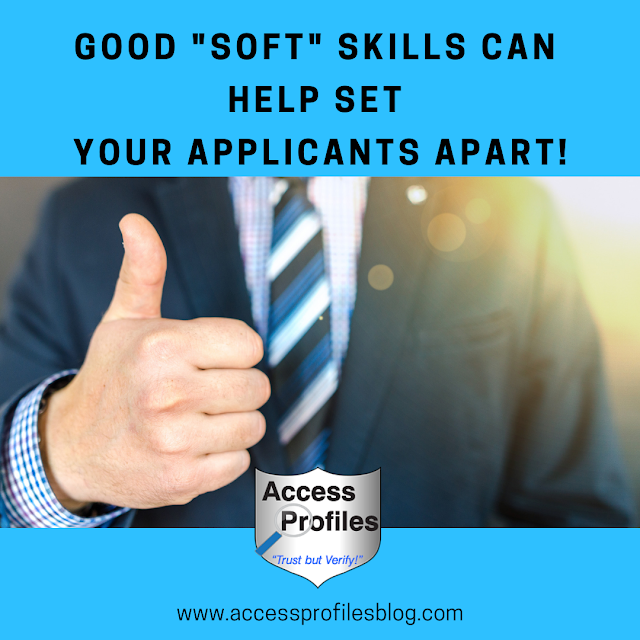 Asking questions of past employers, co-workers, or other references, along with verifying their training and education is invaluable in determining whether your new applicant has both the Hard and Soft Skills you desire. Contact API Today to help you with your employment screening needs.